USD/JPY could gap lower but only below 106.20 will actually be bearish. Shrinking US yields curve arise concerns over future economic developments. The USD/JPY peaked at 107.77 early Friday, its highest since February, but eased after the US opening, amid the sour tone of US equities, as geopolitical tensions sent investors into safety. The decline was limited as US Treasury yields advanced, with the yield for the 2-year note soared to 2.37%, its highest since September 2008, although later retreated. The 10-year note yield ended the day unchanged at 2.83%, reviving concerns about a shrinking yield curve, usually a sign of upcoming economic deceleration. There are no macroeconomic figures scheduled in Japan for the upcoming Asian session, but the conflict in Syria and the missile attack from occidental allies will likely result in some demand for the safe-haven yen at the weekly opening. The daily chart for the pair shows that it holds around March's high but that it's also developing well below a bearish 100 DMA, this last around 108.60. 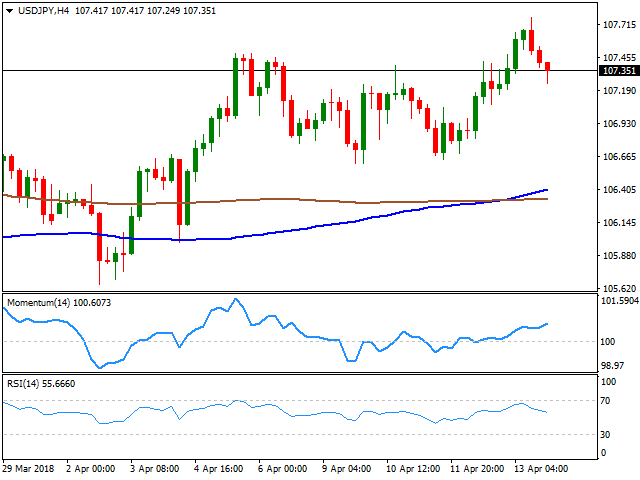 The Momentum indicator in the mentioned chart has turned sharply lower and aims to enter the negative territory, but the RSI presents a modest upward slope around 58. Shorter term, and according to the 4 hours chart, the pair is skewed to the upside, as it holds well above it's 100 and 200 SMA, both converging around 106.20, while technical indicators hold above their mid-lines with opposite directional slopes. Still, risk sentiment is what will lead the way, at least during the Asian session.